Well it’s that time of the year again when winter comes and takes its toll on my skin. It gets dry and flaky and I have to moisturize daily if I want to feel comfortable and look healthy. Moisturizing your body is the biggest chore of all and I think it’s the most boring thing ever haha. I’m not very good at moisturizing regularly and I would always skip it if I can. I know this is bad so I’m constantly looking for products to get the job done fast and easy, without much faff. During the summer it was easy – I was just spraying on some of my Vaseline Spray & Go moisturizer and I was done. Now that winter rolled in though, I find that the spray is not rich enough and I need something more heavy duty. Yet again Lush came to the rescue with their Soft Coeur Massage Bar. This little heart of perfection is everything I look for in a good moisturizer – it hydrates deeply and leaves my skin soft and silky, it’s easy and quick to use, it smells divine and it’s concept is different enough to keep me entertained while I moisturize. If you’re not familiar with the concept of the Lush Massage Bars, basically they are like firm moisturizing blocks, which once in touch with the warmth of skin start to melt and transform into lotion. Soft Coeur is no exception, it applies easily and distributes evenly across the body. It feels very luxurious, it is super creamy and it really does hydrate the skin like there is no tomorrow. I have to mention though that since it is rather rich moisturizer it does leave a slight oily residue, which is why I use it only at night. 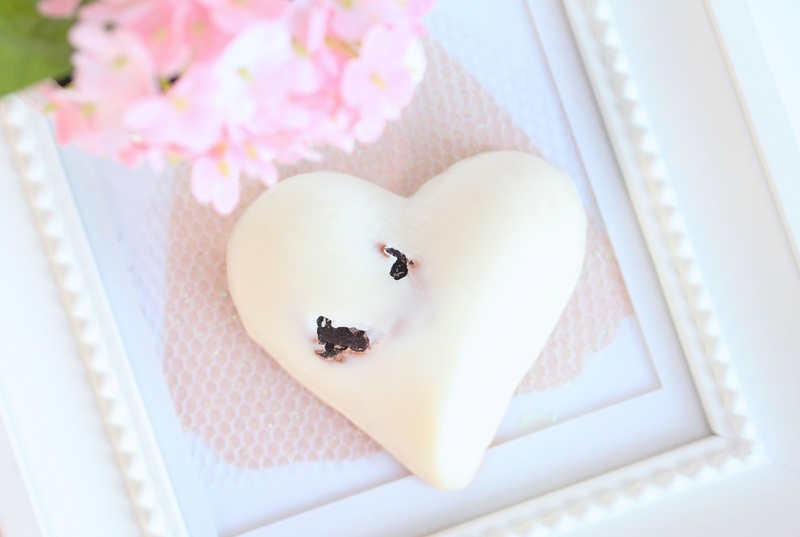 Soft Coeur is enriched with Cocoa butter, Shea butter and Almond oil, which are all known for their amazing hydrating properties. 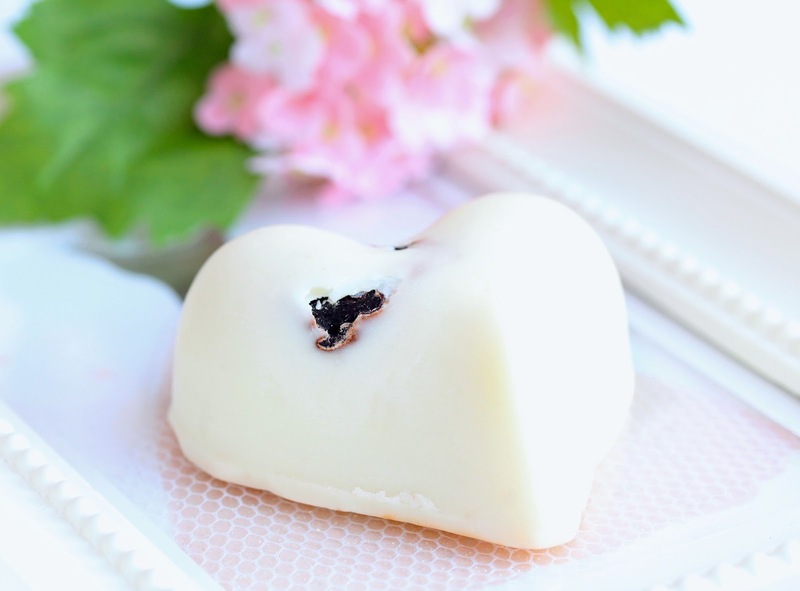 The centre of the yummy heart has honey and little chocolate particles in it, which just makes the whole moisturizing thing irresistible. This is by far my favorite Lush Massage Bar, mainly because of the scent – it smells like something between cookies and honey and I have been tempted to eat the bar on several occasions haha. Have in mind though, that the smell is a bit heavy and it does linger on the skin for a day, which I personally love. If you have sensitive nose though, this moisturizer might not be good for you so give it a good sniff in the store before you buy it. How have I never spotted this one! I need this and am so tempted to run into town and grab it! Looks bloody amazing and sounds like it smells delicious. Have you tried the Each Peach massage bar as well? This is my other favourite, I just can't decide which of the two I like best. This massage bar is heavenly. So easy to use too! No faff with a pump, spray or butter, just literally work this into your skin and voila. Love it! I never tried one but I always thought they sounded lovely especially this one. this looks adorable!!!!!! sounds fab too! I want to try there message bars they look so cute! I've always been interested in the LUSH massage bars. They sound so lovely and they always smell so nice! I'll keep this one in mind. This really does sound luxurious! I suffer from dry skin as well so it sounds right up my alley. Thanks so much for your review! The Lush massage bar is one of the most moisturizing things I have tried. I love them, but Lush is pricey :( Do you think you can do a post on your drugstore favorites? I would love to read about that! I can definitely relate - my skin does not like the winter weather :( Love your blog! I've nearly bought this several times but always go for the peach one, this sounds lovely! This FRP elimination device enables to unlock the gadget with no codes FRPBypass Market rankings reveal that the FRP Reset & Unlock device. You could always keep on playing Kahoots. Constantly remember to keep a document. Kahoot Hack Those rev great deal unary understanding game can be played by anywhere without any cost.